Emergency Pen - Glass Breaker, Distress Whistle, Glass Breaker, Ballpoint Pen in One Tool | BUDK.com - Knives & Swords At The Lowest Prices! Things aren't always as they seem - sometimes a "pen" is more than just a pen. Take this cool emergency pen. As its name suggests, it is, in fact, a ballpoint pen - with smooth-writing, refillable black ink, no less. But it's also so much more - a glass breaker, distress whistle and emergency self-defense solution all in one compact, discreet, easy-to-carry tool. The bitter glass-breaker point is perfect for shattering windows during car wrecks, structure fires or other emergencies, allowing you to escape - or help others escape - entrapment. In a pinch, it can also help fend off or even disable muggers or other assailants. The integrated emergency whistle is ear-piercingly loud, with a shrill pitch that's attention-grabbing and easily heard from miles away. Far more effective than simply screaming for help, it's perfect for summoning help in practically any crisis situation - assaults; wilderness emergencies; vehicle accidents/break-downs in remote locales; avalanche burial; and many more. 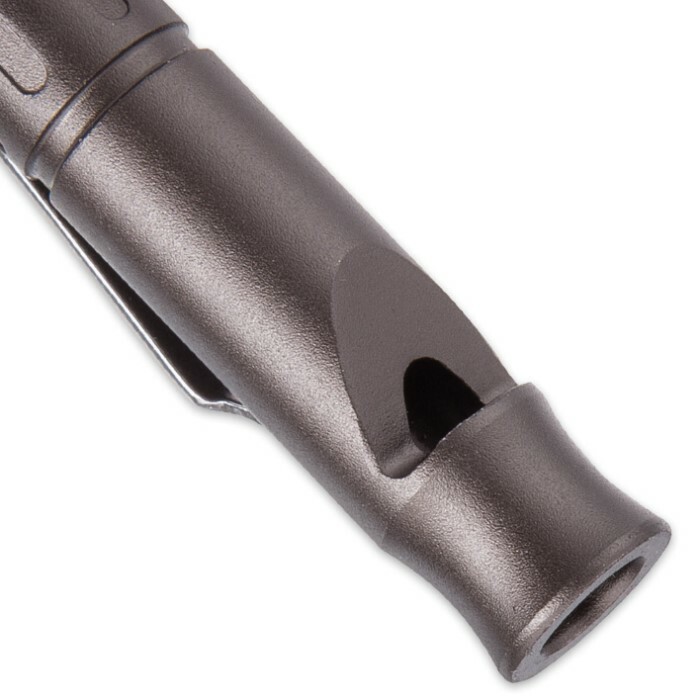 When not in use, the pen point is conveniently tucked away inside the shaft, preventing leakage or stray marks on clothing. To use the pen, simply unscrew the shaft near the middle, separating it into two halves. Then flip over the pen point half and re-join with the pocket clip/whistle half - this time with the pen point facing outward. Few tools pack so much utility into such a compact, easy-to-carry form. When you can't carry a sidearm, survival kit and jaws of life, this versatile emergency pen is the next best thing!